Every once in a while, I do something entirely different, and this is one of those times. Most of my models are well researched, historically accurate, and reasonable representations of aircraft that actually existed. However, what about those airplanes that never existed? If the Luft 46 guys can do it with the Luftwaffe stuff that never got built, why not other time periods? So I got started. The airplane was a sort of parasol winged Bleriot, dating probably from the 1917 period when the United States was just about to enter World War I to make the world safe from the Kaiser. Our aviation industry was almost non-existent except for the Curtiss and Wright companies, and a couple of others, and the executives of all of these firms probably salivated like Pavlov’s dog at the thought of a huge contract to build thousands of combat planes to darken the skies over the Western Front. Needless to say, this didn’t happen, and the vast majority of airplanes operated by the Americans during the course of the war were of British, French, or Italian design. But we tried. The idea was to design and build a fighter prototype based on existing American technology, which by this time, had fallen way behind that of the Europeans. The result was a rotary powered parasol winged monoplane, intended as a single seat fighter or perhaps a fighter trainer. The initial prototype, given the serial of S.C. 400 by the U.S. Army Signal Corps, had an uncovered rear fuselage which must have caused an immense amount of drag. The wings were wire braced top and bottom. The horizontal tailplane was braced on the bottom only, since the rudder was attached to the rear fuselage without the benefit of a vertical stabilizer. Trim tabs, an innovation at the time, were attached to the trailing edges of the rudder, one elevator, and the ailerons. The engine was a concession to modern technological advances, a 130 hp. Clerget rotary attached to a seven foot wooden propeller. The aircraft also had an electrical system, powered by a small wind driver generator located underneath the fuselage center section. In retrospect, except for the powerplant, this airplane is similar to a homebuilt airplane I did the test flying on a few years back, although it was a bit smaller, having only 60 hp. Rather than 130 hp. As I recall, it was a lot of fun to fly. But I digress. I started with a set of wings from an old Airfix Avro 504K kit that I had converted to a Cierva Autogyro a number of years ago. They were still in my scrap and spares box, in perfect condition, just crying out to be used. I shortened the wings, using the center section with the cutout for upward visibility, and rounded the tips to remove the Avro characteristic shape. The fuselage was built up from two engine mounting struts that were extra in the Roden Zeppelin Staaken biplane bomber, and I inserted vertical structural members to create the shape of the open fuselage. The forward section is plastic card, with the rotary engine mounted in front, along with the prop. 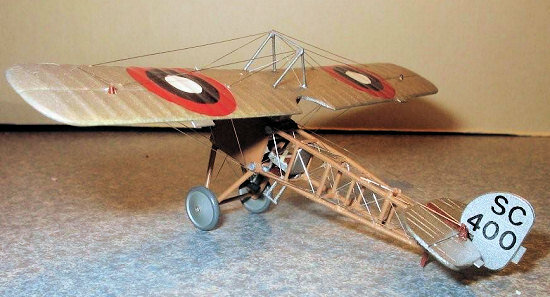 The tailplane is from a Sopwith Camel kit of undetermined origin, and the rudder is from an old Revell Nieuport 17, turned sideways to avoid the characteristic Nieuport rudder outline. The fuselage interior includes a seat, control stick, rudder pedals, masking tape seat belts, and a throttle quadrant. The instrument panel is scratchbuilt. The wings are mounted to the fuselage with four cabane struts, and a small triangular bracing strut assembly is mounted above the cabane struts on the upper surface of the wing center section to attach the landing wires. The landing gear is from an old Renwal Pfalz D.III fighter that I scrapped many years ago, and the wheels are from some World War I aircraft that I scrapped many years ago. 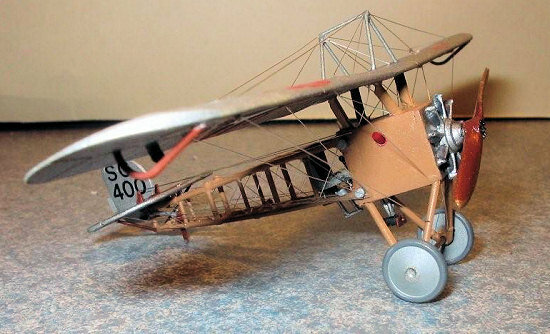 The rotary engine and prop are also from the spares box, but the Clerget is definitely from a Revell Sopwith Triplane. I used electronic wire for all of the bracing and control cables, except for the plastic rod that supports the horizontal stabilizer. I added control horns and control cables, but did not include any armament, as a prototype of this type would not probably have carried any weapons. Other features include the tailskid, wind driven generator complete with wooden prop, a red gas filler cap on the right side of the fuselage, and a clear windshield. 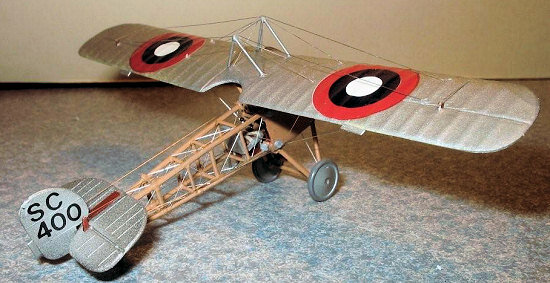 The wing and tail surfaces were painted silver, which was a logical color during the early part of World War I. I used early American roundels from an Olimp Jenny kit, and gave it a Signal Corps serial number that would have normally appeared on the rear fuselage sides if they had been covered. I have several of these “funnies” now, and they are a lot of fun to build. Looking at the completed model, it might possibly have flown, although I suspect that it would have required an especially good test pilot, since the airplane is very top heavy and unstable on its narrow gear track. With the torque problems caused by the rotating engine, it would have been a real beast to take off and land, especially in any kind of crosswind. Maybe it is a good thing that the airplane never really existed. At least it never killed anyone, as so many airplane did during that time.